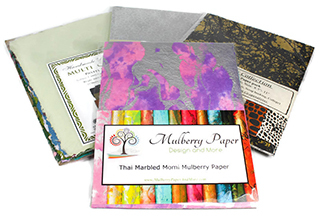 Mulberry Paper: These papers are crafted from the bark of the Mulberry Tree. 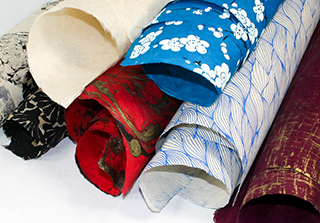 Mulberry papers are known by many names including Kozo, Rice Paper, Hanji and Unryu. 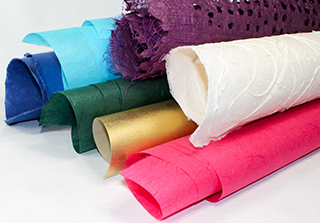 The long fibers of mulberry paper gives it a soft feel, yet maintains a durability not found in traditional papers. Tear the edges of Mulberry Kozo Paper to get a soft, feathered, deckled edge creating a perfect accent for projects such as stationery, wedding invitations and scrapbooks. Mulberry Paper is made in several countries and is available in many different weights from translucent Unryu Paper to Heavyweight Kozo Paper. From archival Korean Hanji Paper to hand-silkscreened Japanese Yuzen Washi, mulberry papers provide a multitude of unique and distinctive qualities for any project. 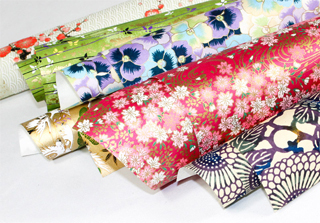 Japanese Washi Paper: Washi is Japanese Paper made with traditional Japanese methods. There are many varieties of Washi Paper available. Chiyogami (Yuzen) Washi starts with a Kozo Paper base, intricate designs are then silkscreened onto the paper by hand creating a colorful and exotic paper. 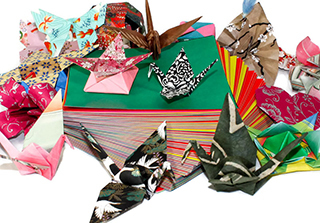 Shuji Gami and Shoji Gami are rolls of traditional Japanese Kozo Paper used in Sumi-E, screens and lampshades. Other specialty Washi Paper includes lace papers and Japanese Stationery, all crafted in Japan. Lokta Paper: Nepalese Lokta Paper is an eco-friendly handmade paper from the fiber of the "Nepal Paper Plant," also called the Daphne Shrub or Lokta Bush. The cultivation of this "tree free" paper is an eco-friendly resource and a reliable revenue stream for the village artisans of Nepal's rural and urban areas. Growing around 6-9,000 feet up in the Himalayan region of Nepal, this bush completely regenerates in about 4 to 6 years after being cut to about 6" from the ground. 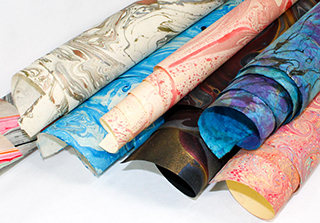 Lokta Paper is available in many colors and designs: from sun-washed to screen printed and textured to marbled. 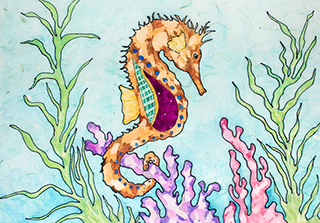 When you need a strong, durable paper, Lokta Paper is the choice for you. 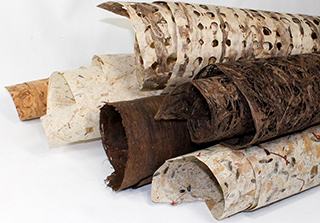 Amate Bark Paper: This ancient bark paper dates back to pre-Columbian and Meso-American times and is still hand made by the Otomi Indian artisans of Mexico using the same methods of their Mesoamerican ancestors from 3000 years ago. Amate Bark Paper has been used through the ages in religious and legal texts and as a canvas for painting. Made from Amate, Nettle, and Mulberry trees, the unique and earthy tones of the trees perfectly blend together for an incredible crafting paper! Through careful and ancient practices, each sheet of this exotic Amate Bark Paper is handmade and will be a great addition to any project! Banana and Mango Paper: Laced with inclusions, these Banana and Mango Papers are a beautiful and durable addition to your paper collection and crafts. Mango and Banana Papers are also an environmentally-conscious paper. Banana trees and Mango bushes produce fruit only once a year and are then cut down, leaving abundant waste or by-product. Recycling the fiber from this by-product, into paper, helps to prevent the ecosystem’s rivers and forests from becoming polluted with waste. Banana and Mango Papers are available in a multitude of colors. Use these papers on their own, or in conjunction with similar papers such as Mulberry Paper and Kozo Paper. Indian Cotton Paper: Inspired by textile patterns and colors, Indian papers make outstanding papers for all art and design applications. Indian Cotton Papers use refined cotton from rags, clothing and textiles instead of pulp from the cotton seed as other papers. This provides longer fibers in the paper providing exceptional strength and durability. From this rugged base paper, intricate patterns or embossings are applied to create fun and interesting papers. Use Indian Cotton Paper in interior design, book binding, scrapbooking and any other paper art project. Egyptian Papyrus: Papyrus, a renewable plant resource, is the oldest writing material in existence today, dating back at least 5,000 years. As early as 2000 BC, papyrus replaced stone and clay tablets and became the choice for legal and official documents. In fact, the word "paper" is derived from its name. Egyptian Papyrus Paper is formed by laying thin strips of papyrus plant stalk in horizontal and vertical (crosswise) layers. Each handmade sheet of Papyrus is unique and often features frayed edges adding to its handmade character. Egyptian Papyrus weighs 120 gsm giving it strength, ideal for painting, writing and drawing. Enjoy writing with Egyptian Paper made from Papyrus.